Apollo 12 Lunar Module Intrepid prepares to descend towards the surface of the Moon. NASA photo. NASA's Apollo program was the first, and to date only, mission to successfully land humans on the Moon, which it did six times. The first landing took place in 1969, when astronauts placed scientific instruments and returned lunar samples to Earth. The ancient Greek philosopher Anaxagoras (d. 428 BC) reasoned that the Sun and Moon were both giant spherical rocks, and that the latter reflected the light of the former. His non-religious view of the heavens was one cause for his imprisonment and eventual exile. In his little book On the Face in the Moon's Orb, Plutarch suggested that the Moon had deep recesses in which the light of the Sun did not reach and that the spots are nothing but the shadows of rivers or deep chasms. He also entertained the possibility that the Moon was inhabited. Aristarchus went a step further and computed the distance from Earth, together with its size, obtaining a value of 20 times the Earth radius for the distance (the real value is 60; the Earth radius was roughly known since Eratosthenes). Although the Chinese of the Han Dynasty (202 BC–202 AD) believed the Moon to be energy equated to qi, their 'radiating influence' theory recognized that the light of the Moon was merely a reflection of the Sun (mentioned by Anaxagoras above). This was supported by mainstream thinkers such as Jing Fang, who noted the sphericity of the Moon. Shen Kuo (1031–1095) of the Song Dynasty (960–1279) created an allegory equating the waxing and waning of the Moon to a round ball of reflective silver that, when doused with white powder and viewed from the side, would appear to be a crescent. By 499 AD, the Indian astronomer Aryabhata mentioned in his Aryabhatiya that reflected sunlight is the cause behind the shining of the Moon. Habash al-Hasib al-Marwazi, a Persian astronomer, conducted various observations at the Al-Shammisiyyah observatory in Baghdad between 825 and 835 AD. Using these observations, he estimated the Moon's diameter as 3,037 km (equivalent to 1,519 km radius) and its distance from the Earth as 346,345 km (215,209 mi), which come close to the currently accepted values. In the 11th century, the Islamic physicist, Alhazen, investigated moonlight, which he proved through experimentation originates from sunlight and correctly concluded that it "emits light from those portions of its surface which the sun's light strikes." By the Middle Ages, before the invention of the telescope, an increasing number of people began to recognise the Moon as a sphere, though many believed that it was "perfectly smooth". In 1609, Galileo Galilei drew one of the first telescopic drawings of the Moon in his book Sidereus Nuncius and noted that it was not smooth but had mountains and craters. Later in the 17th century, Giovanni Battista Riccioli and Francesco Maria Grimaldi drew a map of the Moon and gave many craters the names they still have today. On maps, the dark parts of the Moon's surface were called maria (singular mare) or seas, and the light parts were called terrae or continents. 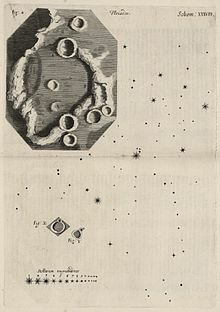 Thomas Harriot, as well as Galilei, drew the first telescopic representation of the Moon and observed it for several years. His drawings, however, remained unpublished. The first map of the Moon was made by the Belgian cosmographer and astronomer Michael Florent van Langren in 1645. Two years later a much more influential effort was published by Johannes Hevelius. In 1647 Hevelius published Selenographia, the first treatise entirely devoted to the Moon. Hevelius's nomenclature, although used in Protestant countries until the eighteenth century, was replaced by the system published in 1651 by the Jesuit astronomer Giovanni Battista Riccioli, who gave the large naked-eye spots the names of seas and the telescopic spots (now called craters) the name of philosophers and astronomers. In 1753 the Croatian Jesuit and astronomer Roger Joseph Boscovich discovered the absence of atmosphere on the Moon. In 1824 Franz von Gruithuisen explained the formation of craters as a result of meteorite strikes. 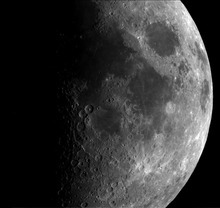 The possibility that the Moon contains vegetation and is inhabited by selenites was seriously considered by major astronomers even into the first decades of the 19th century. In 1834–1836, Wilhelm Beer and Johann Heinrich Mädler published their four-volume Mappa Selenographica and the book Der Mond in 1837, which firmly established the conclusion that the Moon has no bodies of water nor any appreciable atmosphere. The Cold War-inspired "space race" and "Moon race" between the Soviet Union and the United States of America accelerated with a focus on the Moon. This included many scientifically important firsts, such as the first photographs of the then-unseen far side of the Moon in 1959 by the Soviet Union, and culminated with the landing of the first humans on the Moon in 1969, widely seen around the world as one of the pivotal events of the 20th century, and indeed of human history in general. The first image returned of another world from space, photographed by Luna 3, showed the Moon's far side. Luna 9 was the first spacecraft to achieve a landing on the Moon. "First, I believe that this nation should commit itself to achieving the goal, before this decade is out, of landing a man on the Moon and returning him safely to the earth. No single space project in this period will be more impressive to mankind, or more important for the long-range exploration of space." The Soviets nonetheless remained in the lead for some time. 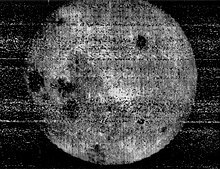 Luna 9 was the first probe to soft land on the Moon and transmit pictures from the lunar surface on February 3, 1966. It was proven that a lunar lander would not sink into a thick layer of dust, as had been feared. The first artificial satellite of the Moon was the Soviet probe Luna 10, launched March 31, 1966. Apollo 17 astronaut Harrison Schmitt standing next to a boulder at Taurus-Littrow during the third EVA (extravehicular activity). NASA photo. On December 24, 1968, the crew of Apollo 8, Frank Borman, James Lovell and William Anders, became the first human beings to enter lunar orbit and see the far side of the Moon in person. Humans first landed on the Moon on July 20, 1969. The first human to walk on the lunar surface was Neil Armstrong, commander of the U.S. mission Apollo 11. The first robot lunar rover to land on the Moon was the Soviet vessel Lunokhod 1 on November 17, 1970, as part of the Lunokhod programme. To date, the last human to stand on the Moon was Eugene Cernan, who as part of the Apollo 17 mission, walked on the Moon in December 1972. See also: A full list of lunar Apollo astronauts. Moon rock samples were brought back to Earth by three Luna missions (Luna 16, 20, and 24) and the Apollo missions 11 through 17 (except Apollo 13, which aborted its planned lunar landing). From the mid-1960s to the mid-1970s there were 65 Moon landings (with 10 in 1971 alone), but after Luna 24 in 1976 they suddenly stopped. The Soviet Union started focusing on Venus and space stations and the U.S. on Mars and beyond, and on the Skylab and Space Shuttle programs. Before the Moon race the US had pre-projects for scientific and military moonbases: the Lunex Project and Project Horizon. Besides manned landings, the abandoned Soviet manned lunar programs included the building of a multipurpose moonbase "Zvezda", the first detailed project, complete with developed mockups of expedition vehicles and surface modules. In 1990 Japan visited the Moon with the Hiten spacecraft, becoming the third country to place an object in orbit around the Moon. 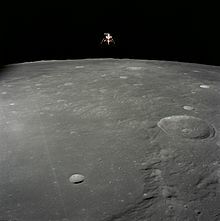 The spacecraft released the Hagoromo probe into lunar orbit, but the transmitter failed, thereby preventing further scientific use of the spacecraft. In September 2007, Japan launched the SELENE spacecraft, with the objectives "to obtain scientific data of the lunar origin and evolution and to develop the technology for the future lunar exploration", according to the JAXA official website. The European Space Agency launched a small, low-cost lunar orbital probe called SMART 1 on September 27, 2003. SMART 1's primary goal was to take three-dimensional X-ray and infrared imagery of the lunar surface. SMART 1 entered lunar orbit on November 15, 2004 and continued to make observations until September 3, 2006, when it was intentionally crashed into the lunar surface in order to study the impact plume. China has begun the Chinese Lunar Exploration Program for exploring the Moon and is investigating the prospect of lunar mining, specifically looking for the isotope helium-3 for use as an energy source on Earth. China launched the Chang'e 1 robotic lunar orbiter on October 24, 2007. Originally planned for a one-year mission, the Chang'e 1 mission was very successful and ended up being extended for another four months. On March 1, 2009, Chang'e 1 was intentionally impacted on the lunar surface completing the 16-month mission. On October 1, 2010, China launched the Chang'e 2 lunar orbiter. China landed the rover Chang'e 3 on the Moon on December 14, 2013, became the third country to have done so. Chang'e 3 is the first spacecraft to soft-land on lunar surface since Luna 24 in 1976. India's national space agency, Indian Space Research Organisation (ISRO), launched Chandrayaan-1, an unmanned lunar orbiter, on October 22, 2008. The lunar probe was originally intended to orbit the Moon for two years, with scientific objectives to prepare a three-dimensional atlas of the near and far side of the Moon and to conduct a chemical and mineralogical mapping of the lunar surface. The unmanned Moon Impact Probe landed on the Moon at 15:04 GMT on November 14, 2008  making India the fourth country to touch down on the lunar surface. Among its many achievements was the discovery of the widespread presence of water molecules in lunar soil. The Ballistic Missile Defense Organization and NASA launched the Clementine mission in 1994, and Lunar Prospector in 1998. NASA launched the Lunar Reconnaissance Orbiter, on June 18, 2009, which has collected imagery of the Moon's surface. It also carried the Lunar Crater Observation and Sensing Satellite (LCROSS), which investigated the possible existence of water in Cabeus crater. GRAIL is another mission, launched in 2011. The first commercial mission to the Moon was accomplished by the Manfred Memorial Moon Mission (4M), led by LuxSpace, an affiliate of German OHB AG. The mission was launched on 23 October 2014 with the Chinese Chang'e 5-T1 test spacecraft, attached to the upper stage of a Long March 3C/G2 rocket. The 4M spacecraft made a Moon flyby on a night of 28 October 2014, after which it entered elliptical Earth orbit, exceeding its designed lifetime by four times. China launched on 7 December 2018 the Chang'e 4 mission to the lunar farside. Since the Chang'e 3 mission was a success, the backup lander Chang'e 4 was re-purposed for the new mission goals. Following the abandoned US Constellation program, plans for manned flights followed by moonbases were declared by Russia, Europe (ESA), China, Japan and India. All of them intend to continue the exploration of Moon with more unmanned spacecraft. India expects to launch another lunar mission in 2nd half of 2019, the Chandrayaan-2, which would place a robotic rover on the Moon. China planned to conduct a sample return mission with its Chang'e 5 spacecraft in 2017, but that mission has been postponed until December 2019 due failure of the Long March 5 launch vehicle. Germany also announced in March 2007 that it would launch a national lunar orbiter, LEO in 2012. However the mission was cancelled due to budgetary constraints. In August 2007, NASA stated that all future missions and explorations of the Moon will be done entirely using the metric system. This was done to improve cooperation with space agencies of other countries which already use the metric system. In 2018 NASA released plans to "return to the Moon with commercial and international partners as part of an overall agency Exploration Campaign in support of Space Policy Directive 1. They plan to start with robotic missions on the lunar surface, as well as a Lunar Orbital Platform-Gateway for astronauts in space beyond the Moon. Right now, NASA is preparing to purchase new small lunar payload delivery services, develop lunar landers, and conduct more research on the Moon’s surface ahead of a human return." The European Space Agency has also announced its intention to send a manned mission to the Moon, as part of the Aurora programme. In September 2010, the agency introduced a "Lunar lander" programme with a target of autonomous mission to the Moon in 2018. On September 13, 2007, the X Prize Foundation, in concert with Google, Inc., announced the Google Lunar X Prize. This contest requires competitors "to land a privately funded robotic rover on the Moon that is capable of completing several mission objectives, including roaming the lunar surface for at least 500 meters and sending video, images and data back to the Earth." In March 2014, SpaceX indicated that while their current focus is not on Lunar space transport, they will consider commercial launch contracts for one-off Moon missions. Russian Federation spacecraft is planned to send cosmonauts into Moon orbit in 2025. Russian Lunar Orbital Station is then proposed to orbit around the Moon after 2030. ^ O'Connor, J.J.; Robertson, E.F. (February 1999). "Anaxagoras of Clazomenae". University of St Andrews. Retrieved 2007-04-12. ^ a b c d Needham, Joseph (1986). Mathematics and the Sciences of the Heavens and Earth. Science and Civilization in China. 3. Taipei: Caves Books. p. 227; 411–416. ISBN 978-0-521-05801-8. ^ a b Langermann, Y. Tzvi (1985). "The Book of Bodies and Distances of Habash al-Hasib". Centaurus. 28 (2): 111–112. Bibcode:1985Cent...28..108T. doi:10.1111/j.1600-0498.1985.tb00831.x. ^ Toomer, G. J. (December 1964). "Review: Ibn al-Haythams Weg zur Physik by Matthias Schramm". Isis. 55 (4): 463–465. doi:10.1086/349914. ^ Van Helden, A. (1995). "The Moon". Galileo Project. Archived from the original on 2004-06-23. Retrieved 2007-04-12. ^ a b c "The Galileo Project". Archived from the original on September 5, 2007. Retrieved 2007-09-14. ^ Энциклопедия для детей (астрономия). Москва: Аванта+. 1998. ISBN 978-5-89501-016-7. ^ "LEK Lunar Expeditionary Complex". astronautix.com. Archived from the original on 8 December 2013. Retrieved 12 June 2015. ^ "DLB Module". astronautix.com. Archived from the original on 7 January 2014. Retrieved 12 June 2015. ^ "Kaguya (SELENE)". JAXA. Retrieved 2007-06-25. ^ "SMART-1 Impacts Moon". ESA. 4 September 2006. Archived from the original on 2006-10-25. Retrieved 2006-09-03. ^ David, Leonard (4 March 2003). "China Outlines its Lunar Ambitions". Space.com. Archived from the original on March 16, 2006. Retrieved 2006-03-20. ^ "Technological advancements and promotion roles of Chang'e-3 lunar probe mission". Sci China Tech Sci. 56 (11): 2702. 2013. ^ "Chandrayaan-1 Scientific Objectives". Indian Space Research Organisation. Archived from the original on 2009-10-12. ^ "India sends probe on to the Moon". BBC. November 14, 2008. Retrieved 2008-11-16. ^ "First commercial mission to the Moon launched from China". Spaceflight Now. 25 October 2014. Retrieved 24 July 2015. ^ "China Readies Moon Mission for Launch Next Week". Space.com. 14 October 2014. Retrieved 24 July 2015. ^ "Saft lithium batteries powered the 4M mini-probe to success on the world's first privately funded Moon mission" (Press release). paris: Saft. 21 January 2015. Archived from the original on 24 July 2015. Retrieved 24 July 2015. ^ China launches historic mission to land on far side of the Moon Stephen Clark, Spaceflight Now. 07 December 2018. ^ Nowakowski, Tomasz (9 August 2017). "China Eyes Manned Lunar Landing by 2036". Retrieved 17 August 2017. ^ Jeff Foust (25 September 2017). "Long March 5 failure to postpone China's lunar exploration program". SpaceNews. Retrieved 17 December 2017. ^ Covault, Craig (2006-06-04). "Russia Plans Ambitious Robotic Lunar Mission". ^ "Russia to place man on Moon by 2030 leaving Mars to NASA". 2015-06-27. ^ news, Spiegel (2007-02-28). "Germany plans own Moon mission". Spiegel Online. ^ Warner, Cheryl (2018-04-30). "NASA Expands Plans for Moon Exploration". NASA. Retrieved 2019-04-01. ^ esa. "Next step for ESA's first Moon lander". European Space Agency. Retrieved 12 June 2015. ^ "Google Sponsors Lunar X PRIZE to Create a Space Race for a New Generation". X PRIZE Foundation. Archived from the original on 2009-05-11. Retrieved 2007-09-13. ^ Gwynne Shotwell (2014-03-21). Broadcast 2212: Special Edition, interview with Gwynne Shotwell (audio file). The Space Show. Event occurs at 12:00–13:30 and 27:10–28:15. 2212. Archived from the original (mp3) on 2014-03-22. Retrieved 2014-03-22. ^ "National Space Exploration Campaign Report" (PDF). NASA. September 2018. Wikimedia Commons has media related to Moon missions.